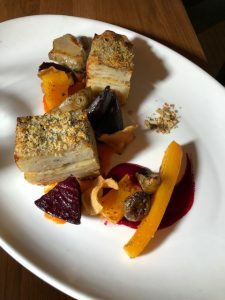 Outside of the Whistler Cornucopia festival that I attended last month, I also visited some places on my own starting off with dinner at Hunter Gather which opened about 6 months ago. 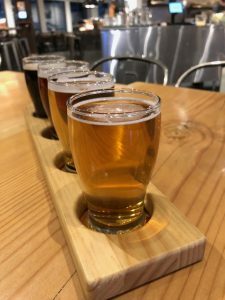 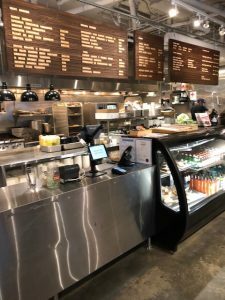 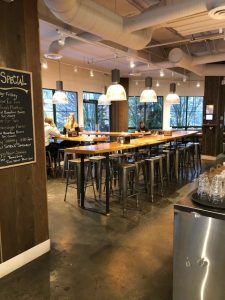 The restaurant is quite large with lots of seating both inside and out, the rustic eatery has an open kitchen as well as a full bar filled with craft beer taps. 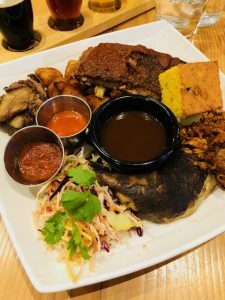 Here I had a chance to try one of their Meat Platters, it was Grant’s Family Style Farm Platter E-I-E-I-O a tasting size set up for me with their 18 Hour Smoked Dry Rubbed BC grass fed Beef Brisket; 6 Hour Smoked St.Louis Pork Ribs full rack, hickory, sweet hot spiced molasses house BBQ sauce; BBQ chicken leg, pulled pork, cornbread and coleslaw with their house-made ketchup and bbq sauce; what an incredible tasty feast paired with some craft brews on a beer flightwith Coast Mountain Brewery and Backcountry Brewing beers. 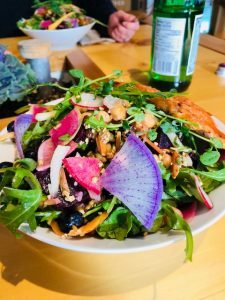 The next day, I returned to Hunter Gather for a healthy lunch and enjoyed their Pemberton Bowl with local beets, dried fruit, crisped organic vegetables, fresh herbs, chickpeas, sprouted legumes and miso chili vinaigrette with side of their in- house smoked salmon fillet; also had a chance to talk with Hilarie, one of the co-owners about the restaurants vision and so much more. 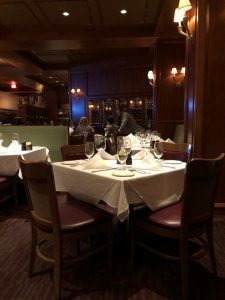 Later in the day for dinner, I visited Hy’s Steakhouse & Cocktail Bar, here it was all about fine dining, with white tablecloths and dark wood surroundings. 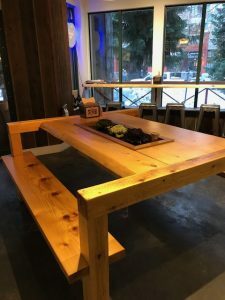 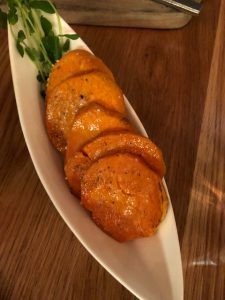 I have always enjoyed eating at Hy’s in Vancouver, so this was a welcome opportunity to enjoy a similar experience at their restaurant in Whistler. 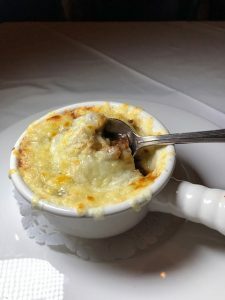 I had the delicious baked French Onion Soup with its gooey cheese and caramelized onions; I also had the Halibut with a scallop on top of a squash purée, with celeriac fritters and a lobster tail on the side with drawn butter, a stunning dish! 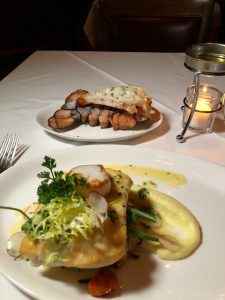 The next day, I visited Basalt for a delightful dinner, they are located in the Crystal Lodge and Suites hotel. 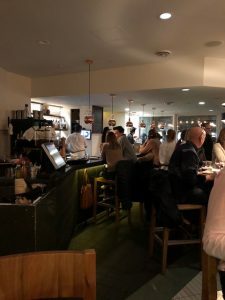 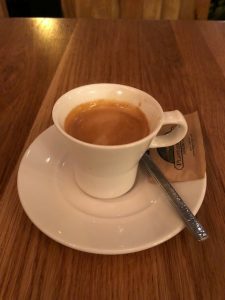 Their wine list features both local and international regions and an extensive selection of wines by the glass, they have cured meat and cheese offerings that are carefully selected from the best products available, and their plated menu dishes which I enjoyed emphasizes artisanal fare. 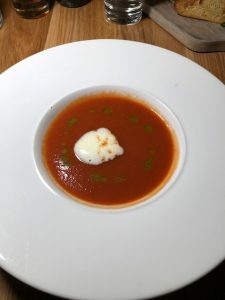 Here I had the delicious Smokey Tomato Bisque with Asiago foam, charred scallion oil; I also had the Fall Harvest Farm Plate with potato celeriac gratin and Pemberton farm vegetables. 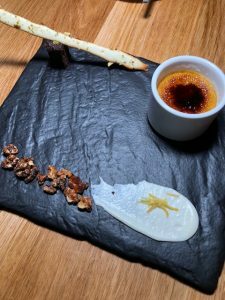 Pumpkin & Little Qualicum creme brulee. 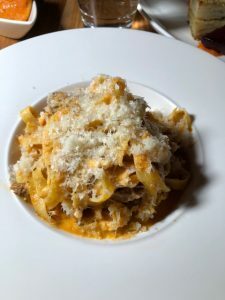 The Lamb Tagliatelle in a rich tomato cream sauce was perfect for the cold weather, on the side I had the Orange Sesame Yams; followed the mains up with some dessert along with an Espresso and their outstanding Pumpkin & Little Qualicum creme brulee.